We know that the earliest Christians sang hymns. Paul encourages believers to sing "psalms, hymns, and spiritual songs." And at the dawn of the second century the Roman official Pliny names a feature of Christian worship as "singing alternately a hymn to Christ as to God." But are some of these early Christian hymns preserved for us in the New Testament? Are they right before our eyes? New Testament scholars have long debated whether early Christian hymns appear in the New Testament. But where some see preformed hymns and liturgical elements embossed on the page, others see patches of rhetorically elevated prose from the author's hand. Matthew Gordley now reopens this fascinating question. He begins with a new look at hymns in the Greco-Roman and Jewish world of the early church. Might the didactic hymns of that cultural current set a new starting point for talking about hymnic texts in the New Testament? If so, how should we detect these hymns? How might they function in the New Testament? And what might they tell us about early Christian worship? An outstanding feature of texts such as Philippians 2:6-11, Colossians 1:15-20, and John 1:1-17 is their christological character. And if these are indeed hymns, we encounter the reality that within the crucible of worship the deepest and most searching texts of the New Testament arose. 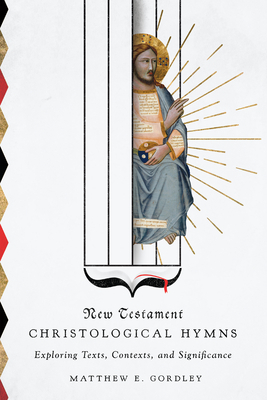 New Testament Christological Hymns reopens an important line of investigation that will serve a new generation of students of the New Testament.